The very popular Siemens 353 SLC controller was discontinued, leaving many process users high and dry for a suitable replacement. 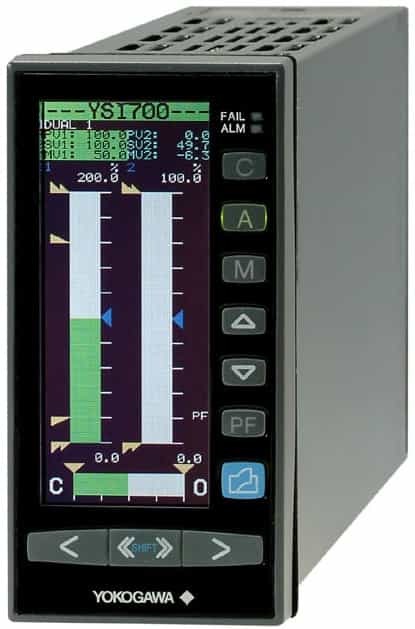 We're glad to announce that there is a great alternative - the Yokogawa YS1700 PID loop controller. The YS1700 is a drop-in SLC replacement for the Siemens 353 and is an ideal choice for many control applications offering extreme reliability and sophisticated control. This product family has bright, easy-to-read displays, multiple I/O points, and powerful loop tuning. For critical applications, the YS1700 employs dual CPUs for maximum reliability and hard-manual control for added protection. Nuclear qualified with industry acceptance and installations. The YS series has been tested to meet the most stringent demands of the nuclear industry and has industry acceptance. Servicing the nuclear industry requires a commitment in quality and longevity. ABS Type approved for marine and offshore applications. Yokogawa has the only ABS Type approved 3X6 controller on the market for marine and offshore applications. Selecting an ABS approved unit allows the customer to install the YS without the cost of additional testing and special inspection required by the shipping bureau. Extensive experience in boiler applications. Automated control of industrial boilers is an excellent application for YS1700 controllers. These instruments can be programmed to perform the operations of plant master, boiler master, fuel and air control with oxygen trim, and drum level / feedwater control. The YS1700 is a reliable and cost effective means of upgrading boiler controls and increasing boiler efficiency while lowering operating costs by implementing advanced control strategies. A proven upgrade path to protect your engineering investments in installation and application development. Yokogawa’s YS1000 is backwards compatible to all of its legacy 3x6 controllers developed since 1965. The YS has been designed to reuse the expense of hardware installation and engineered application development. These items are not required to be reengineered when upgrading to a future product family. Upgrading a legacy Yokogawa controller with a new, modern unit can be done in 25 minutes. The housing and wiring stays in place and only the control unit is replaced. Application software can be automatically converted and installed in the latest models. Features like dual CPUs, the hard manual back-up, hot swappable LCD, and the portable back-up station ensures that a controller mishap, standard maintenance, or product upgrade will not prevent a control signal from reaching the final control element. A very high mean time between failure calculation minimizes unexpected failures, and the nonvolatile memory means no batteries to fail and no surprising program loss.